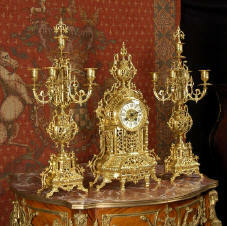 A beautiful, small gilt brass clock set that will easily sit on a 5" mantle shelf if required by folding in the candelabra arms, see the pictures below. Style is Louis XVI, classical and symmetric decorated with floral swags and urns. 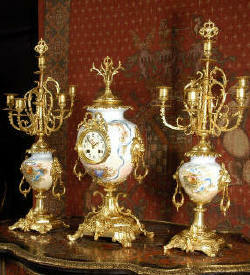 A graceful and unusual antique French clock set, as three ceramic, gilt mounted urns standing almost 2 feet tall. The porcelain is a delicate pale blue shading to a delightful blush pink, hand painted with cherubim, rose and ribbon swags. The largest urn holds the clock which has the prettiest dial painted with a cherub trying to catch a butterfly with a butterfly net. Perfect country house chic! ....Click here for full details! Clock Set ~ Japy Freres. A Large and impressive antique French Gothic clock set by Japy Freres; beautifully made in gilt brass, very heavy and crisply modelled and with much of the original gilding remaining. The style is typically French gothic....Click here for full details! 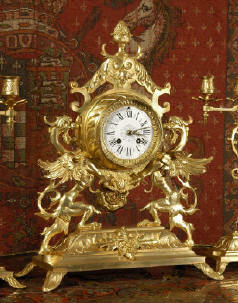 A beautiful Louis XVI style gilded clock set, architectural in shape and profusely decorated with delicate floral fret work. To the sides of the dial stand two mythical creatures. 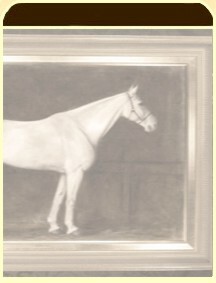 The original finish is clean and bright and displays beautifully....Click here for full details! 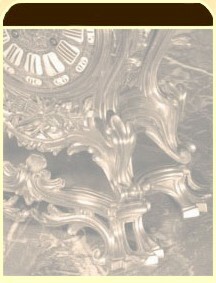 Cupid - Stunning Antique French Clock Set. 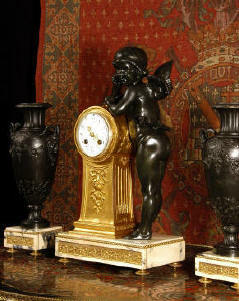 A very chic clock set featuring a beautifully modelled figure of cupid standing beside the clock, mounted in a gilt metal pillar. Cupid is made of bronze patinated metal which is in excellent original condition. 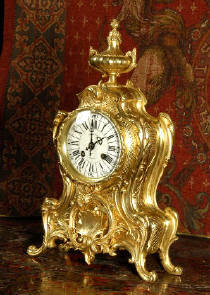 An Antique French Rococo boudoir clock, stunning in its original gilding which is bright and clean. The case is boldly modelled in typical Rococo style, a waisted key hole shape decorated with fine 'c' scrolls, shells, acanthus leaves and floral swags. To the front of the case beneath the dial is a panel of shell and floral swags ....Click here for full details! 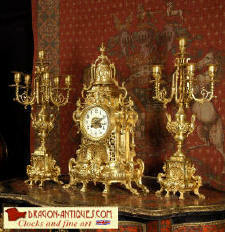 Antique French Gilt Brass Clock Set, Dragons. 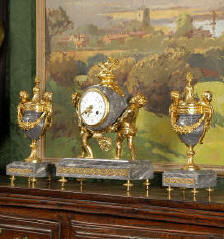 A very decorative clock set by Samuel Marti, featuring two dragons holding the clock aloft. Clock movement itself is fitted in a drum with the pendulum visible swinging below. The candelabra are similarly modelled as dragons holding banners, on top of which is mounted five light candelabrum....Click here for full details! A very pretty boudoir clock, a classical four column portico with the clock mounted between with the pendulum swinging below. It is made of the most beautiful variegated specimen marble which is mounted with ormolu (gilded brass). 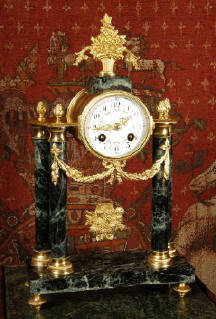 A chic and decorative clock set of Italian Bardiglio variegated grey marble mounted with gilded metal. Two cherubim struggle to hold the clock aloft which is fitted in a marble case which is surmounted by a finial of a quiver of arrows and a bow. Pendulum is a sun goddess and can be seen swinging beneath the case....Click here for full details! 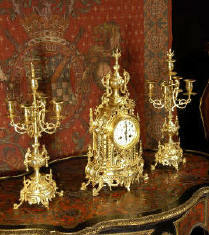 Japy Freres Antique French Clock Set. 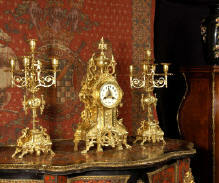 A very decorative Japy Freres gilt brass clock set in excellent condition. It is French Gothic in style, with lions mask and hairy paw feet. It is constructed of brass with a gilded finish which is in excellent bright and clean condition....Click here for full details!